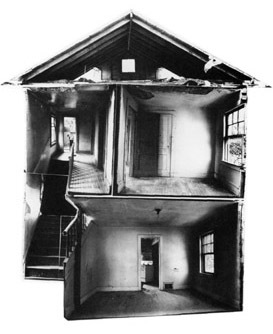 To me the plan (more like a way-finding map – removed – abstracted – about iconography) means something entirely different than the section photo montage by Gordon Matta-Clark above. I like the collage of photographs each room with it’s own vanishing point. Vanishing point – that assumes that there is a subject perspective…. a point of view. Therefor I can imagine being in this space… I like the offering of being able to “see it all at once” yet I’m, not really able to a have true understanding of the space. That’s what’s challenging in this work. What we think we see in photos recomposing a certain kind of reality… In this case Gordon’s. I like it. Incidentally, the work and other stories of Matta-Clark will be shown at the Whitney coming next year. Should be a show worth seeing. This entry was posted in Architectural Photography, Experimental, Photography, Sculpture and tagged Gordon Matta Clark by Matt Niebuhr - West Branch Studio. Bookmark the permalink.